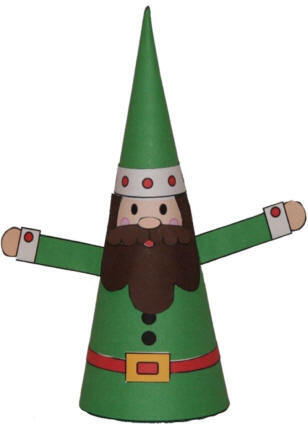 Set this elf out on a coffee table or the mantle as a fun Christmas decoration or put him on the top of a small Christmas tree as a tree topper. The directions are appropriate for an older child or adult to assemble. Don't worry too much if younger children glue the pieces a bit off kilter -- part of the fun of watching them grow is seeing their progress over the years! Roll the large triangular piece and use the tab to glue it into a cone shape. Glue the nose onto the face using a dot of glue on the nose (this allows the mustache to stick out from the edges a bit in a slightly 3d manner). Glue the hat band around the top, just above the face. Glue the beard around the top, just below the face. You can see how the mouth fits into the little notch in the beard. Glue the belt around the center, just below the buttons. Fold the arms in half and glue together (so they're coloured on both sides). Use a dot of glue on the top of the arms (shoulder) to position the arms near the beard, leaving them sticking out in a slightly 3d manner. You can have them sticking straight down, reaching forward, waving, etc... however you want your elf to look! ).